El Titan de Bronze cigar company is based in Miami, Florida and located in the cigar mecca known as Calle Ocho in Little Havana. They have been in business since 1995 and currently employ eight rollers and one master blender. They produce 1000 cigars daily and plan on producing 35,000 Redemption cigars a year. Only 100 retailers will be offering this cigar. The brand name comes from a Cuban General named Antonio Maceo who was fearless in battle. He just happened to have skin the color of bronze and so was given the name El Titan de Bronze. I want to thank Kevin over at Silo cigars for providing me with a sample of this cigar, please visit his website because he stocks some really fantastic cigars and if you don't see what you are looking for, give him a call because he probably has it in stock, just not posted on his website. I am really such a fan of small ring gauge cigars. I try to stock up on coronas and lonsdales as much as possible because I find them to be very flavorful and doesn't take too long to smoke. The El Titan de Bronze Redemption corona which they call the "Coronita" is really one flavor bomb of a smoke. It measures 44 ring gauge by 5 and 1/2 inches and sports a beautiful deep reddish brown wrapper. It wasn't flawless however, the cigar I smoked for this review had one rough looking vein which traveled the length of the cigar. One spot along this vein tore a small hole in the wrapper but it was minor and didn't affect the burn at all. The cap on this cigar is triple layered albeit slightly uneven. The cigar feels a little soft but you get a nice free draw in return. I would rather have this than a plugged, packed cigar anytime. The Redemption wrapper is from Ecuador and is a Sun Grown Habano. The binder and filler is from Nicaragua. 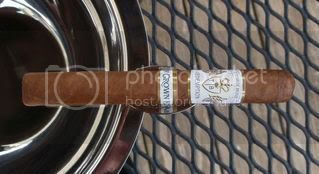 When you light up this cigar and take the first puff, you can tell right away that it is a full flavored cigar. The smoke volume that it emits is tremendous and you get a nice big wallop of flavor each draw. The finish though is surprisingly clean and you don't get too much lingering residue of flavor. I tasted a really nice tangy wood flavor with a backbone of hot cinnamon spice. I don't normally blow smoke through my sinuses but I inadvertedly did and boy, what a searing blow! I found this cigar to be equally as smooth as it was powerful. The cigar eventually transitioned into a really tasty, spicy leather with some roasted macadamia nut flavor. The spice was pretty much consistent throughout and you get a nice tingle on your tongue and in the back of your throat. Nevertheless, it was never harsh and I even broke out my toothpick to nub this baby. The cigar, though not packed, still managed to remain cool throughout the smoke. In closing, I would like to say that this cigar is worth every bit of it's $5.70 per stick price tag. I would highly recommend it to experienced cigar smokers. It burns well with a sharp and even burn line. The ash is light to medium gray and holds on despite it's flaky appearance. If you are a fan of spicy full-flavored cigars, then you should definitely give the El Titan de Bronze Redemption a try. This sounds like a really nice blend and cigar. I have read a fair bit about it and watched a video review. I ordered two boxes of the Maduro version with the Mexican wrapper, which is a first for me. They have not arrived yet because I live in the UK. I am really looking forward to smoking some of these cigars. The UK premium cigar market is totally dominated by the Cuban puro brands which are very expensive: average price about $25 - $41 US Dollars. For taste, quality and price I prefer the cigars available in the USA.